Found 6 file extension associations related to RagTime and 6 file formats developed specifically for use with RagTime. 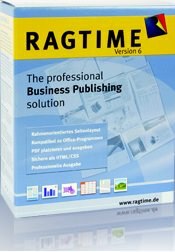 RagTime is a unique and professional publishing software for tasks in the fields of graphical design, prepress, office, and database publishing. Collecting, editing, designing and sharing data from different species plays in almost every industry, businesses and institutions of all sizes an important role and takes up a significant portion of working time. In business publishing make the operation of an office environment, alongside the professional record possibilities of desktop publishing. In a comfortable environment layout, text, spreadsheets, images, drawings and diagrams integrated into a single document. Typical documents are the business publishing sales records, such as synopses, price lists and catalogs, reports, statistics and analysis. Whenever facts and figures must be treated well presented, one comes to the business publishing with RagTime not around. What makes business publishing software from one? Separations typical office RGB data (eg from clip art, scanner or digital camera) for output in conventional printing. If you need more information please contact the developers of RagTime (RagTime GmbH), or check out their product website.